Persistence Market Research delivers yet another objective, comprehensive and insightful report titled ‘Minimally Invasive Surgical Instruments Market: Global Industry Analysis (2012-2016) and Forecast (2017-2022)’. Through this report, the readers get a thorough briefing on the global minimally invasive surgical instruments market and this report contains comprehensive discussions on the drivers, restraints and trends operating in this highly lucrative market. In addition, analysis of data over different parameters has been carried out in order to arrive at the on the dot and accurate market numbers concerning the global rehabilitation market. Besides, the competition landscape section of the report provides information on the level of competition in this highly competitive market and gives detailed information regarding the important companies operating in the global minimally invasive surgical instruments market. In the first part of the report, the executive summary and the introduction are presented. The executive summary gives a brief outline of the global minimally invasive surgical instruments market and gives the pertinent market numbers that are most significant, which include the historical CAGR growth from 2012 till 2016 and the forecasted CAGR from the year 2017 till the end of the forecast period in the year 2022. Information about lucrative markets from the point of view of leading revenue share and highest CAGR are also given in the executive summary. In the introduction section, the minimally invasive surgical instruments market is defined in detail so that the report readers are clear about the scope of this market. The next section of the report gives information on the key dynamics of the minimally invasive surgical instruments market. Key points covered in this section include the global economy, fiscal stimulus and bottom line of enterprises. In the subsequent section of the report, information is given on the cost structure analysis and pricing analysis of the global minimally invasive surgical instruments market. An analysis on the market presence of key participants (intensity map) is also offered in this section. The next part of the report consists of the global minimally invasive surgical instruments market analysis and forecast by product type, end user, application and region. This section of the report contains important market numbers in the form of year-on-year growth comparison, market share comparison and revenue comparison. The global minimally invasive surgical instruments market is also analyzed across key regions- North America, Latin America, Europe, Japan, APEJ and MEA. The last part of the report contains the competition landscape, where important companies that are functioning in the global minimally invasive surgical instruments market are profiled in detail. The information presented in the competition landscape is in the form of company overview, overview of the products that the particular company is selling, financial information of the company and important developments that are related to that particular company. In the competition landscape, SWOT analysis of the selected companies is also given, which gives deep insights about the functioning of the selected companies. The competition landscape is a valuable part of the global minimally invasive surgical instruments market report as it gives information about how the important companies stay at the pole position in this market and implement strategies to stay on top in this highly competitive market. Persistence Market Research uses a proven and tested research methodology to derive the revenue estimates of the global minimally invasive surgical instruments system market. A deep and comprehensive secondary research is carried out in order to arrive at the overall market size and determine the top industry players. Subsequently, a list of industry players (manufacturers), distributors, retailers and industry experts is developed and a discussion guide for detailed and comprehensive primary interviews is also developed. Data obtained from this primary and secondary research is validated using the triangulation method. This data is then inspected using advanced tools to get pertinent insights into the global minimally invasive surgical instruments market. Global minimally invasive surgical instruments market is growing at a robust pace throughout the world. The factors contributing to the growth of this market are an increase in the geriatric population and consequently there is an increase in the number of surgeries performed on such section of the population. The type of surgeries performed include orthopedic surgeries, cardiac surgeries, etc. Moreover, the minimally invasive surgeries have inherent advantages over traditional type of surgeries such as occurrence of lesser pain, shorter stay at the hospital, less amount of scaring and low damage to the tissue, which are increasing the popularity of minimally invasive surgeries across the globe. Moreover, minimally invasive surgeries tend to be more cost effective than traditional surgeries and this is also boosting its market growth. In addition, technological innovations in the field of minimally invasive surgery and increase in the occurrence of medical tourism in the developing countries serve as bright opportunities in the minimally invasive surgical instruments market. However, there are questions being raised about the quality of the surgeries being performed through this method and sterilization procedures that are improper are the factors that are hampering the growth of minimally invasive surgical instruments market. 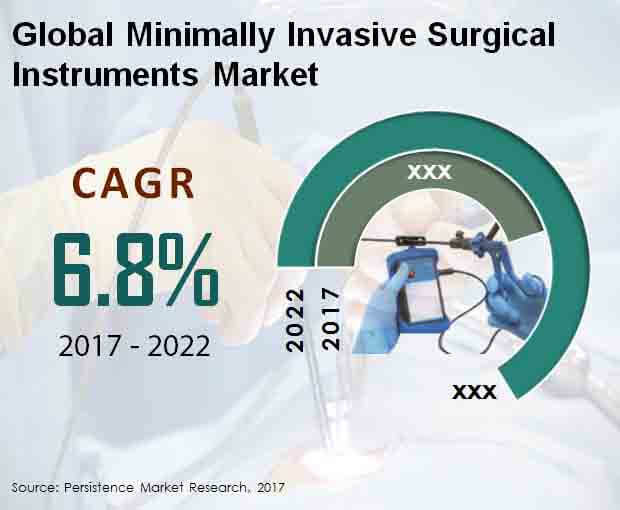 According to the assessment of Persistence Market Research, the global minimally invasive surgical instruments market is forecasted to reach a figure of about US$ 18,900 Mn in 2022 and is poised to exhibit a robust CAGR in the period of assessment. The market in North America is set to dominate the global minimally invasive surgical instruments market in terms of value and this trend is projected to sustain itself throughout the assessment period. North America minimally invasive surgical instruments market is the most attractive market, growing at a robust CAGR over the forecast period. According to the projections of Persistence Market Research, the handheld instruments segment is expected to reach a value of about US$ 5,200 Mn in the year 2022. This signifies a robust CAGR during the forecast period of 2017-2022. The handheld instruments segment is estimated to account for more than one-fourth of the revenue share of the product type segment by the end of the year 2017 and is expected to gain in market share by 2022 over 2017. According to the assessment of Persistence Market Research, the hospitals end user segment is poised to touch a figure of about US$ 13,700 Mn in the year 2022. This signifies a CAGR of more than 7% during the assessment period from 2017 till the year 2022. The hospitals end user segment is estimated to account for nearly three-fourths of the revenue share of the end user segment by the end of the year 2017 and is projected to gain market share by 2022 over 2017. The report also profiles companies that are expected to remain active in the expansion of global minimally invasive surgical instruments market through 2022, which include Medtronic Plc., Aesculap, Inc., B. Braun Melsungen AG, Stryker Corporation, Smith & Nephew Plc., Abbott Laboratories Inc., Boston Scientific Corporation, CONMED Corporation, Microline Surgical, Inc. and Zimmer Biomet Holdings, Inc.